Need A Fast And Reliable Repair On a Power Supply Unit? Repair Zone Is Here! Repair Zone is quite familiar and proficient with Allen Bradley Power Supply repairs. We have the capabilities to repair both newer generation Allen Bradley power supplies as well as older units such as the 8520 9-Series. Speaking of repairs, a trademark here at Repair Zone is that we don't just "fix" the problem we actually perform preventative maintenance as well. And in the final stages of the repair the power supply will be tested on an complete servo drive-motor loop that operates in a CNC machine. We even have test carts for older series like the 6000 and 8000. Having the ability to run our customer's power supplies in model specific test stands adds to our confidence that what we are sending back is repaired right and ready to go, for the long haul. Call today 989-922-0043 for expert Allen Bradley Power Supply repair and any of your Allen Bradley Automation equipment needs! 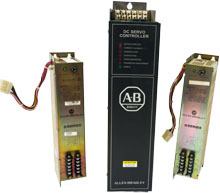 Or, browse our Allen Bradley Power Supply Inventory for repair, exchange, or purchase.